Almost 30 years ago, Leonor fell down a flight of stairs and broke her knee. Although she went straight to the hospital, the doctors were not able to keep the infection from turning into gangrene. Three months after her accident, she was told that her leg would have to be amputated. Leonor’s amputation changed her life dramatically. A homemaker with five young children, she now struggled to care for her family and run her household. When her husband died a few years after the accident, life became even more difficult. For the past eight years, Leonor has used a prosthetic limb constructed by her nephew from metal and rope. Although functional, the leg was extremely heavy and very difficult to use. 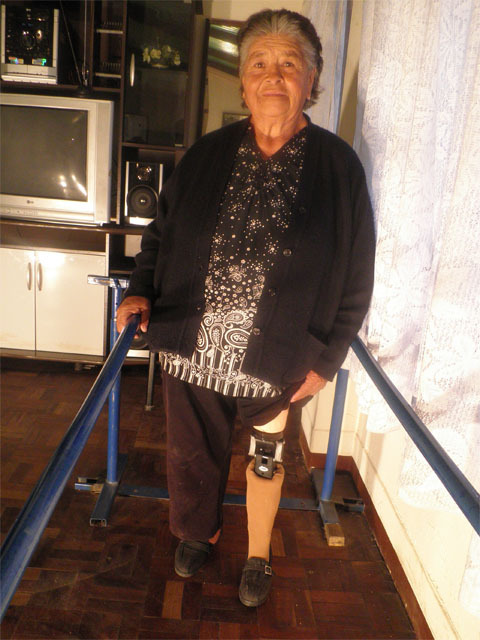 Since being fitted with the LIMBS Relief Knee at the Centro de Miembros Artificiales in 2012, Leonor, who was once completely dependent on her family to care for her everyday needs, has been able to regain some of her independence.